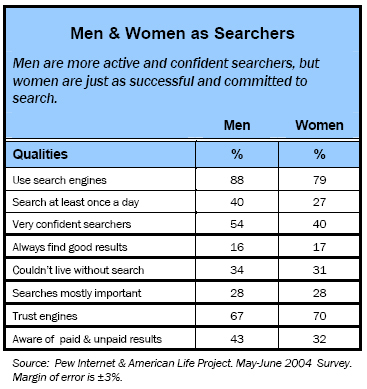 Gender differences: Men have a higher search profile than women. More men than women use search engines and use them more often. In significant numbers, men are more likely to use search engines than women. Some 88% of men who are Internet users have used search engines, compared to 79% of women. Men also search more frequently: 40% of men search at least once a day, compared to 27% of women. That includes 28% of men who search several times a day, significantly more than the 16% of women who do so. On the other extreme 36% of women search no more than every few weeks, significantly more than the 24% of men who are infrequent searchers. Men have a higher opinion of themselves as searchers than women do. Men show more confidence in themselves as searchers. While about equal numbers of men and women are confident about their search abilities, over half of men, 54%, say they are “very” confident, compared to 40% of women. And 50% of women describe themselves as somewhat confident, compared to 38% of men. However, this confidence does not translate into successful searching. Equal numbers of men and women say they always find the results they are looking for (17% for women and 16% for men), and overwhelming numbers say they find positive results most of the time (69% for women, 72% for men). Men and women have similar feelings about the importance of their searches, and they both trust their engines. Despite these differences in search engine use, men and women are equally enthusiastic about the role of search engines in their lives. About a third of each say they couldn’t live without search engines (34% of men and 31% of women), and roughly half say they like search engines, but could go back to traditional ways of finding information if they had to (48% of men and 51% of women). Likewise, there are no differences in the importance of the information they search for. Just over half of both men and women say they search for as much important information as trivial information (56% of women and 54% of men). Some 28% of both men and women say the information they search for is “mostly important” while just under a fifth (16% for women and 18% for men) say they search for “mostly unimportant” information. Men and women trust their search engines about equally. Some 67% of men and 70% of women say they are a fair and unbiased source of information. Men stick with a single search engine more than women. Some 47% of men regularly use just one search engine, compared to 40% of women. On the other hand, 51% of women use 2 or 3 engines, compared to 44% of men. Men are more familiar with the issues surrounding search than women are: 43% have heard of the paid v. unpaid search results, significantly more than the 32% of women. But this difference doesn’t carry over into how men and women notice, discern, or avail themselves of paid results. And more men have heard about the issue of search engines tracking user behavior: 51% of men and 34% of women. Younger users are more at ease in the world of online searching. Younger users are more likely to search than older users, and to do it more often. The younger the user, the more likely he is to use search engines and use them frequently. Some 89% of those under 30 years have used search engine, compared to 85% of those 30 – 49 years; 79% of those 50 – 64 years and 67% of those over 65 years. Frequency of use follows a similar pattern: 27% of those under 30 years use search engines several times a day, compared to 25% of those 30 – 49 years; 15% of those 50 – 64 years and 8 % of those over 65 years. Younger users are more confident searchers. Regardless of age, internet searchers are confident in their ability to search. Nearly all users under 30 years, 97%, express confidence, compared to 93% of those 30 – 49 years; 83% of those 50 – 64 years and 79% of those over 65 years. Degree of confidence follows a similar patterns, with 53% of those under 30 years being “very” confident in their abilities, and dropping down to 29% of those over 65 years. In greatest numbers, the youngest users, 22% of them, say they always find the information they were looking for. This is compared to 16% of those 30 – 49 years; 13% of those 50 – 64 years and 9% of those over 65 years. But even the oldest users, 74%, say they are successful at least most of the time. Younger users are the most enthusiastic searchers. Also, younger users are more likely to say they can’t live without search engines. Over one third of users under age 50 say they couldn’t live without them (36% for those under 30 years and 35% for 30 – 49 year olds). For those 50 – 65 years of age, 26% say they couldn’t live without them, and it drops to 18% of those over 65 years old. 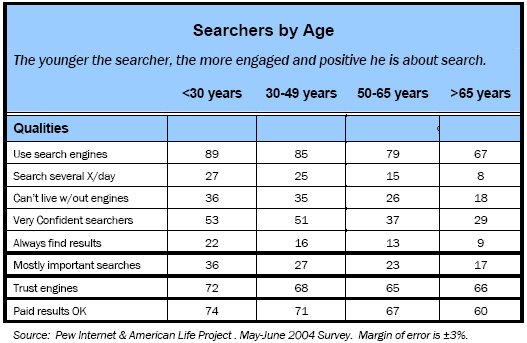 For all age groups, about half of user say they like search engines but could go back to the old fashioned ways of searching, while older users, from 50 – 65 years old, are most likely (23%) to say they wouldn’t really miss search engines if they disappeared tomorrow compared to 22% of those 50 – 64 years, 15% of those 30 – 49 years, and 14% of those under 30 years. Regardless of age, most users (from 48% for those under 30 years to 61% for those over 65 years) say that they search for a mixed bag of both important and trivial information. But more young users are more serious about their searches than older users. Some 36% of those under 30 years say the information they search for is mostly important to them, while 17% of it is mostly unimportant. On the other extreme, only 17% of those over 65 years say they search for mostly important information, and 22% say it is mostly unimportant. Older users are less trusting and more conservative in what they’re comfortable having their search engines do. Age is a small factor in search engine trust. There are no significant differences in how users see search engines as a fair and unbiased source of information, although younger users are more trusting than older users. Some 72% of those under 30 years say engine are fair and unbiased, compared to 68% of those 30 – 49 years; 65% of those 50 – 64 years, and 66% of those over 65 years. Interestingly, there are some differences in how users feel that search engines can make paid results most obvious to them. All agree that using the words “PAID” or “SPONSORED” is the most effective. The most notable number is that 20% of those over 65 years can’t or won’t answer the question. This is a very high response rate in this category, indicating a distinct level of discomfort or unfamiliarity among these older users. Two matters of principle with search engine behavior are associated with age. Younger users are more likely to be tolerant of search engines providing some paid or sponsored results. Some 74% of those under 30 years say this, compared to 71% of those 30 – 49 years, 67% of those 50 – 64 years and 60% of those over 65 years. Likewise, age draws a dividing line for ethics: Significantly, 77% of those under 30 years approving of the idea of tracking searches, provided finally if engines are clear about what they’re doing, 70% of those 30 – 49 years; but only 59% of those over 50 years, where they wouldn’t approve under any circumstances. Veteran users who have been online the longest are more plugged into searching. Most veteran users, those who have been online at least 6 years, are very plugged into the search world. They’re active searchers, they have positive attitudes toward searching, they rely on search engines much more in their lives, and they are more abreast of the issues in the search world. Many users try searching early on in their internet careers, and by the time they’ve been online for 6 years, nearly all of them are searchers: 90% of 6 year veterans have searched online, compared to 79% of 4 -5 year vets, 73% of 2 – 3 year vets and 65% with one year or more online. They also search more frequently: some 31% of 6 year vets search at least several times a day, compared to 11% of shorter-term users. These veterans also have strong attitudes about searching. Significantly more of 6 year veterans, 39%, say they “couldn’t live without Internet searches”, compared to 24% of those who have been online 4 – 5 years, and 20% of those who’ve been online 3 years or fewer. More of 6 year veterans, 49%, say they “need to find” most or all of the information they search for online than others, at 38%. Not surprisingly, these users are also very confident about their search abilities. Some 51% of 6 year veterans are “very confident”, compared to 41% of 4 – 5 year veterans, and 28% of those who have been online 3 years or less. Some 46% of 6 year vets have heard about the difference between paid and unpaid results, compared to 26% of others. And 51% of 6 year veterans have heard about tracking issues, compared to 32% of others. Part 5. Is users’ trust in search engines blind?